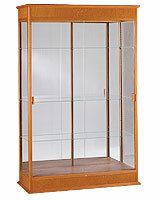 These Wood and Glass Trophy Cases For Sale Are Quick Ship Models! 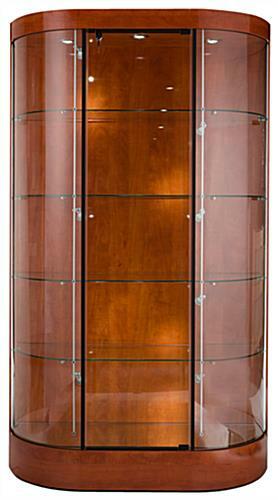 These Display Cabinets Are Shipped Fully Assembled From Our Warehouses Directly To You! Locking door keeps merchandise safe! Wheels make cases easy to relocate! Seven side track lights, spaced over 2 side tracks, illuminate items at every level! 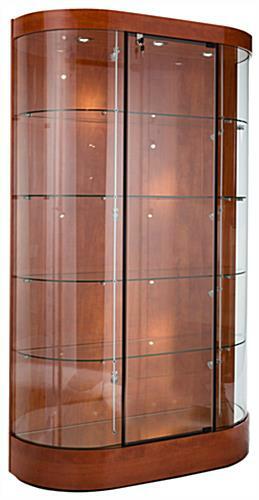 These trophy cases, also known as display cabinets, have many great features. The cases have three (3) 5-watt LED top lights to illuminate memorabilia from above. They also feature seven (7) additional LED spotlights affixed upon a track running the height of the display cabinets. These allow your merchandise & memorabilia to be illuminated at every level. A mirror deck further highlights items within the cases. 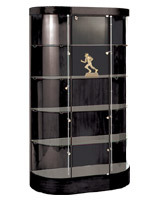 The curved front trophy cases feature a solid back (to stand flush against a wall) and a curved tempered glass front panel. Four (4) fixed-height shelves offer five (5) levels of display space within the cases. Wheels make it simple to move the 280 lb. trophy cases. 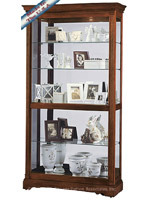 These display cabinets ship pre-assembled so setup is quick & easy! 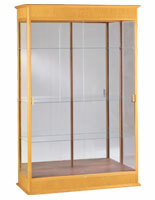 Trophy cases are the perfect way to keep your merchandise on display, and safe at the same time. Retail stores use these showcases most often, but they can be seen in a wide variety of environments. 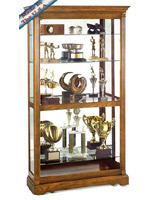 Schools or corporate office buildings use trophy cases to showcase trophies, awards, certificates and other memorabilia. Museums will find display cabinets useful for keeping artifacts safely on display to patrons. 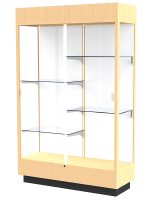 These display cabinets, trophy cases are great for jewelry stores to display necklaces, earrings, rings, bracelets and more! In fact, gold & silver jewelry looks stunning against the rich cherry backdrop of the showcase. This showcase is a Quick Ship model. In order to reduce lead time we have completed 85% of the assembly process in advance. Please allow 4 work days for us to complete final assembly prior to shipping. Our lead time averages only 4 days, not 6 weeks like other vendors!